Sitting in traffic in Los Angeles all day or in the office is the easiest way to go stir crazy. Growing up in New Hampshire, nature was always around me and I sincerely miss just looking out the window to so much greenery. Because of that (and the fact that my landlord really would prefer me not get a cat) I have decided to bring nature inside my tiny studio apartment and want to share with you my sweet little plant babies that make coming home after a long day so refreshing. My NUMBER 1 TIP to successful plant parenting is DRAINAGE HOLES. I cannot even begin to explain to you how many plants I accidentally overwatered before figuring this out and this has been GAME CHANGING when it comes to having starting out with few “easy” plants (such as succulents) to growing and expanding into this thriving, lush Jungalow. I cannot believe how quickly these three have grown. I got all of them at the end of the summer last year and they have been thriving and are such a joy to see grow. I found their happy places, where the sunlight is just right for them, and how they best like to be cared for, and they are all growing so tall and green. This Totem Pole Cactus is just plain gorgeous. I picked her up from the Long Beach Flea Market from a man with a random assortment of plants and honestly I had no idea what she was, I just thought she was cute and a great type of plant for the studio I am in. 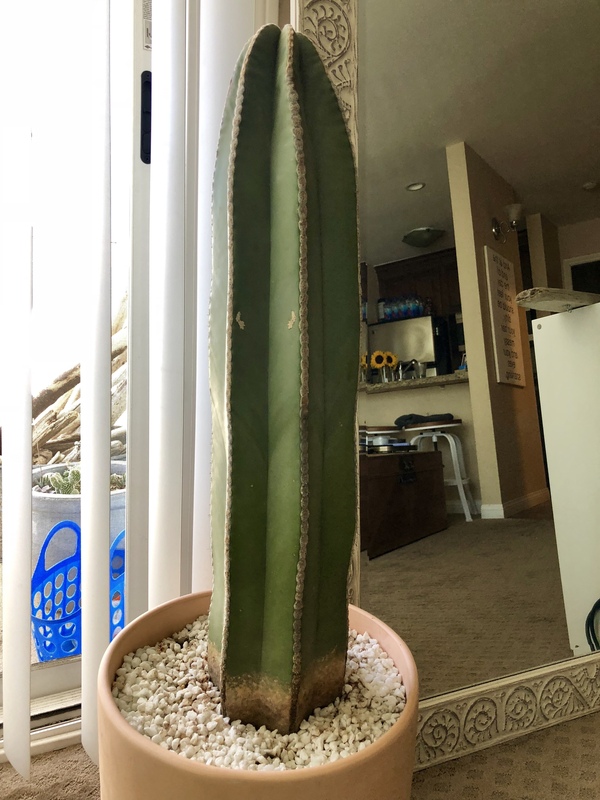 Because my space is limited, a cactus with big branches definitely would not have worked out and I liked how I hadn’t seen her before often in people’s homes. Be warned, though she does not look sharp those prickles are definitely something that can bite and repotting her I should have used a lot more than just a towel to wrap her in (she’s HEAVY too!). This Fiddle Leaf Tree was such a little babe when I got her from the Flea Market down in Long Beach, CA. (It actually took me three trips to the flea to score one of these beauties – the best plant guy sells out by 7 AM!). Fiddle Leaf Trees are native to Africa and love a hot and sunnier environment. 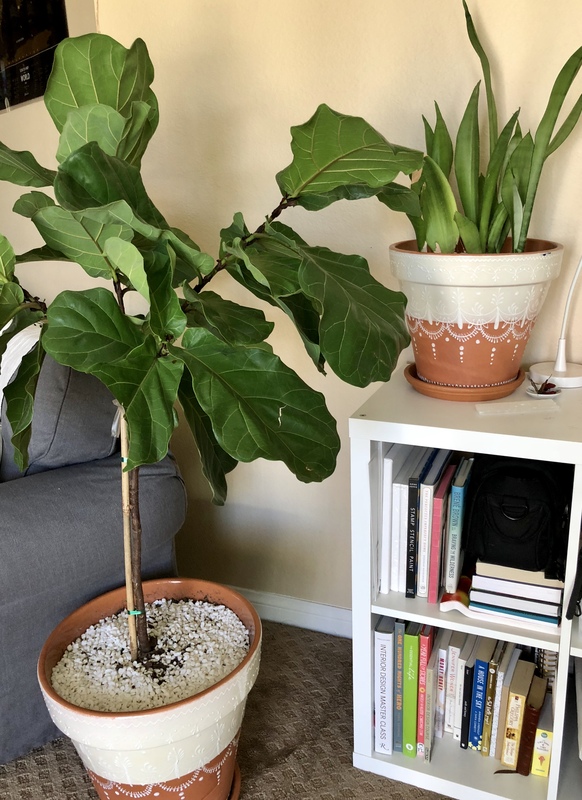 Everyone says that Fiddle Leaf Trees are finicky but (knock on wood) once I found the perfect lighting space for this baby it has been thriving ever since. She likes to be in indirect light so I have her placed right across from my slider window where light comes in but cannot burn the leaves. When her leaves start to crinkle inwards I give her a large mason jar of water. I’ve heard she will need more water over the summer, so I will keep an eye on her (did I mention the key to my plant survival includes drainage holes in all of my pots), as I got her the end of September last year and haven’t had a full, hot, Southern California summer with this beauty yet. This snake plant is honestly one of the easiest plants I have EVER owned and just keeps growing beautifully! Honestly, the more I tend to ignore her (oops) the better she seems to grow! I give her water randomly and pay attention to her leaves. This is one of my favorite things and I have been doing this for wow, over a year now. I saw an image of it forever ago on Pinterest and thought it was just such a pretty way to incorporate greenery into another aspect of my home. I tie a few branches at the top into a V and place it on top of my showerhead. This way, it is easy to remove in a few weeks once the leaves have dried out, aren’t as yummy smelling, and need to be replaced with a fresh set. The steam releases the scent of the Eucalyptus oil (you all know how much I adore essential oils) and it just makes the morning shower feel more like a spa experience then a rushed “gotta get to work” task. Eucalyptus oil is supposed to aid with clear breathing and a sense of relaxation and wow is it invigorating. I get my Eucalyptus at Trader Joes or Whole Foods and usually get either the Silver Dollar or the Baby Blue depending on what they have in stock – but the Baby Blue definitely has more scent and I love it! Let me know if you’ve ever done this too and what your favorite benefits are. My deck is one of my favorite places to be now that it is so green and fresh with all of these plant babies on it. I have a large pot of cacti and succulents, a smaller one of those as well and an American Lavender plant that I picked up from the local farmers market. The lavender smells incredible! I’m hoping to dry some of it to hang above my bed. 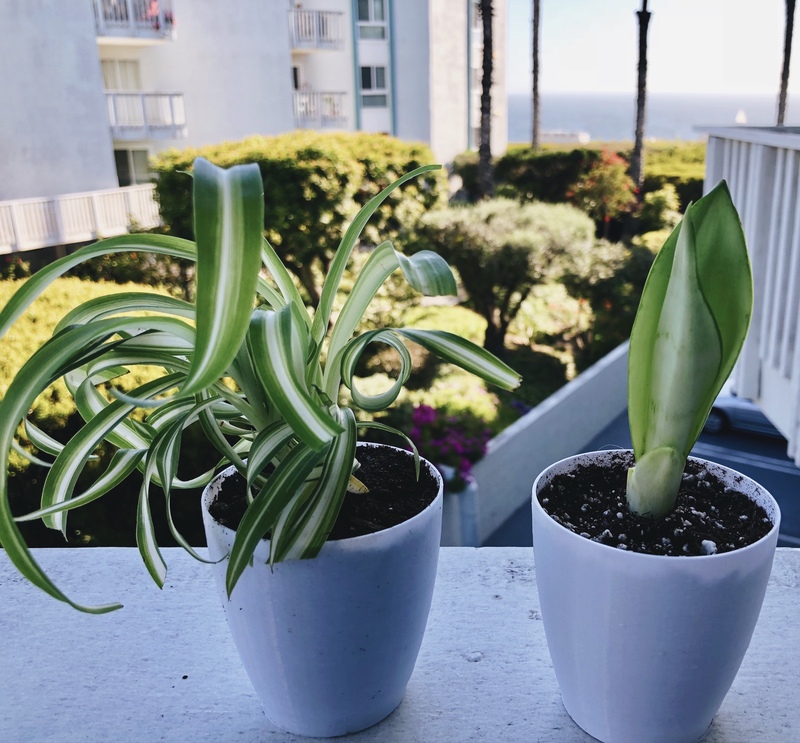 Because of how easy it is to take care of my snake plant, I recently purchased another one from this adorable Etsy shop Pretty In Green Plants who shipped me exactly what I was looking for and my plants arrived quickly and in great condition. 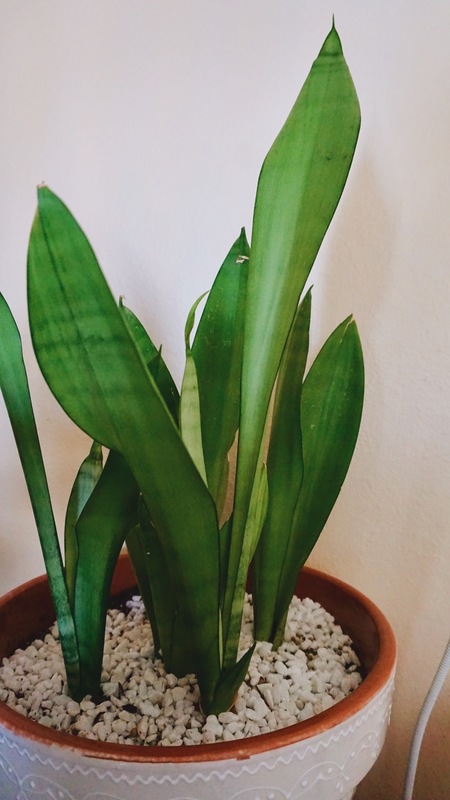 I was picky about my snake plant, they come in so many colors and was really after a Moonshine colored one, which I found on her site and she was so quick to assist me with any questions. 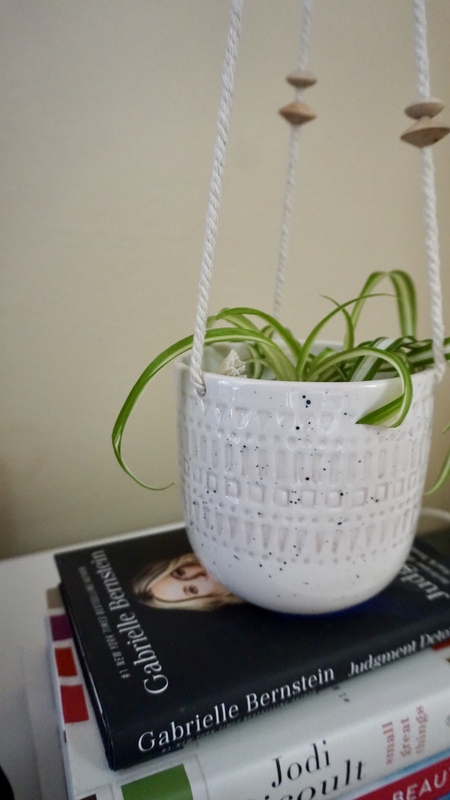 I also received this sweet little Spider Plant which I am smitten over. We used to have these in my Mom’s house when I was growing up and I had forgotten about that until I got this little baby. The nostalgia! Now I’m just patiently waiting for my tall friend to come back from his trip to help me hang this baby up in the adorable planter I got locally, at GumTree LA. I’m also planning on adding a baby Monstera to my mix. I love seeing these little ones grow strong and mighty and am so excited about these new additions. I also have been keeping eucalyptus in my shower for years. Used to steal little branches from the huge eucalyptus trees at UC Berkeley! Though I feel like it’s only stealing because of campus rules, not because the tree didn’t want to share it’s beauty and magic (breathing) powers with me 😄 Since then I started keeping it everywhere — in my closet, laundry room, towels drawer… and it makes everything smell amazing! My all time obsession is with burgundy rubber trees, can’t get enough of their deep colors and burgundy accents. I have a few large ones but last summer I cloned a little branch from my friend’s tree, which I keep on the window sill of my bathroom and it provides all the coverage and privacy I needed without having to add any materials that might grow mildew. Now I’m hoping it doesn’t grow too fast this spring and run out of space there! Excited to see how your Jungalow keeps growing!